NOVICE TO PROFESSIONAL: with this deluxe drawing kit, begin drawing as soon as you open the box. 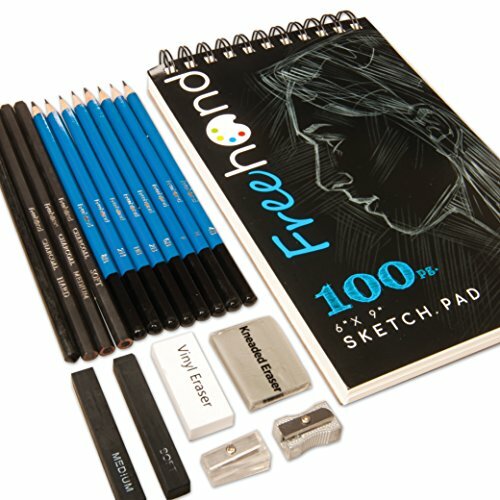 Complete drawing supplies and artist pencils with a sketch pad of medium weight, non-smudge professional sketching paper by Freehand. Kit includes charcoal sticks, kneaded eraser and pencil sharpeners. PENCILS, ERASERS, 100 PG SKETCH PAD: this value packed drawing set will allow you to immediately begin honing your art skills. Equip yourself with sketching pencils ranging in size from the thickest, 8B, to the finest, 2H for exact drawing lines. Perfect art set for adults and kids. ALL-IN-ONE: this art set comes boxed, and in a plastic case with all the supplies organized neatly. Gift this kit to all ages: kids art supplies to arts and crafts for adults! Start someone down a creative path, equipping them with their first drawing pencil and complete sketching pencil set. QUALITY GUARANTEE - Free Hand Art Supplies represents superior quality and customer service with your highest satisfaction or a money back guarantee. We are confident you will enjoy these art sets, complete with a pencil set, and all other items the sketch artist needs. All the art supplies for artists in one place! Very pleased with the completeness of this set! Fun skectching set!!! This is my first ever sketch set.